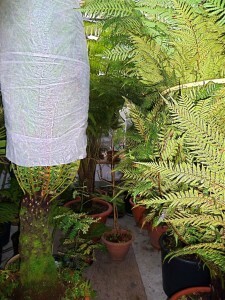 Like other exotic plants, tree ferns also need a winter protection. Because it is almost impossible to create a separate description for each species, you will find here a general description. The most common species among enthusiasts is the Dicksonia antarctica. This is one of the simplest tree ferns to cultivate. The Dicksonia antarctica can survive for a short period of time up to -8°C/-10°C (17,6-14°F) (night frost) without specific protection. If temperatures below -6°C (21,2°F) are predicted for a longer period of time, it is recommended to protect it. The Dicksonia antarctica loses its leaves (become brown) at temperatures colder than -8°C/-10°C (17,6-14°F) or when the leaves are directly exposed to snow or ice. 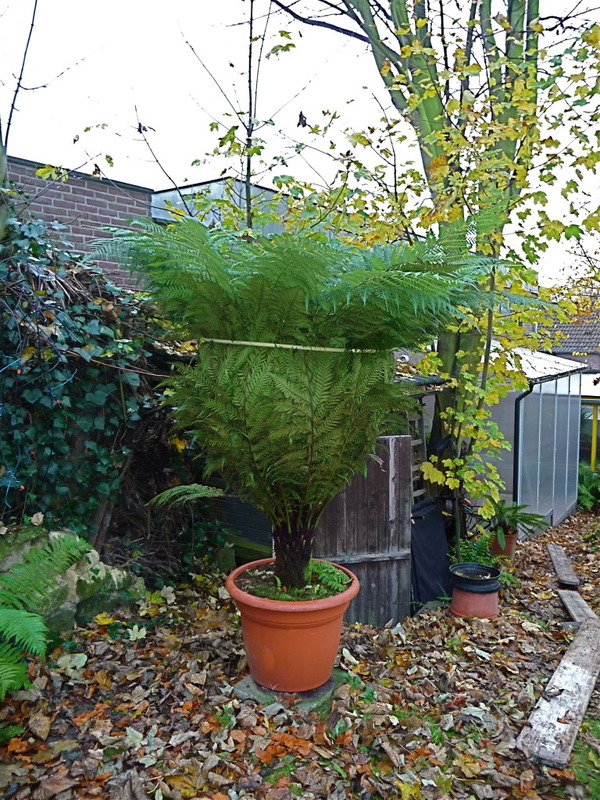 Protecting the tree fern can be done in various ways. The most common way of protecting is to put a clot of fleece cloth, bubble wrap or straw in the heart of the fern and then wrap it with a few layers of fleece cloth. Roll a layer of bubble wrap over the fleece to keep the moisture inside as the trunk may never dry out. This method is also suitable for protecting the leaf. Remember, however, that this method will not provide sufficient protection for temperatures below -10°C (14°F). When it is even colder, you can use more layers of cloth or even a light tube or heating cable to heat up during the coldest nights. Be vigilant in this process to avoid drying out the trunk! The soil around the trunk should best be covered with a layer of old leaves, bark,…. or any other organic material. You can also leave the Dicksonia antarctica somewhere frost-free to overwinter between 0°C and 8°C (32-46,4°F). Make sure that the stem and growth point do not dry out during the winter. Especially if there is additional heating. This is forgotten by many, who than still lose their tree fern after all. The Dicksonia fibrosa and Dicksonia sellowiana resist up to -6°C/-8°C (21,2-17,6°F). The will need protection when persistent temperatures below -5°C (23°F) are announced. Leaves are damaged by temperatures below -4°C/-6°C (24,8-21,2°F) or when the leaves are directly exposed to snow or ice. The Dicksonia squarrosa and Dicksonia youngiae resist up to -3°C/-5°C (26,6-23°F). Keeping thesespecies outside during winter requires a lot of attention simply for the fact that these species are quickly affected by drying out. The heart of the stem is hollow in these species and the plant has almost no buffer. It is therefore very important that they do not dry out during the winter. Both species will have leaf damage at temperatures below -2°C/-4°C (28,4-24,8°F) or when the leaves are directly exposed to snow or ice. Cyatheas (only the most hardy species within this genus) can be kept outside during winter but only with sufficient protection. It will therefor be needed to well wrap it and heat with an external heat source. Cyatheas will show leaf damage at temperatures below krijgen bladschade als de temperatuur onder de -2°C/-4°C (28,4-24,8°F) or when the leaves are directly exposed to snow or ice. Even better is to keep the Cyathea protected from frost at 0°C and 8°C (32-46,4°F). The more tropical species need to be kept between 6°C and 12°C (21,2-53,6°F). This way they will conserve their foliage and will still be very neat in spring. Do not forget to keep them moist during all this time when temperatures will allow. During the winter months, the tree ferns naturally consume less moisture due to the low temperature. However, this does not mean that the tree fern should dry out. Water once a week is recommended. However, the plant should not be too wet neither. The most important thing about wintering is therefore the prevention of drying out and that the protection does not allow too much moisture to evaporate.